Welcome to the Industry Signup for I-4 Beyond the Ultimate. The Florida Department of Transportation (FDOT) is currently preparing to build two projects in Phase 1 in South Orange County and two interim projects in Seminole County. 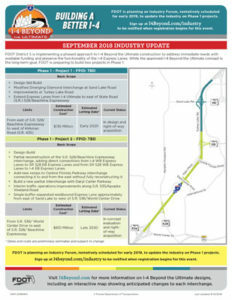 For the Phase 1 projects, FDOT is planning an industry forum that is tentatively scheduled for Fall 2019. Please provide your information to be notified when registration begins for upcoming I-4 Beyond the Ultimate industry forums. If 'Other' please explain in the comment box below. Is your firm DBE certified? Is your firm SBE certified?